In 4-quart saucepan or Dutch oven, place eggs in single layer. Add enough water to cover eggs by 1 inch. Heat to boiling. Immediately remove from heat; cover and let stand 15 minutes. Drain; rinse with cold water. Place eggs in bowl of ice water; let stand 10 minutes. To remove shell, crack it by tapping gently all over; roll between hands to loosen. Peel, starting at large end. Cut eggs lengthwise in half. Into medium bowl, slip out yolks; mash with fork. Stir dressing mix, mayonnaise and mustard into yolks. Spoon or pipe yolk mixture into egg white halves. Sprinkle with chives. Refrigerate at least 30 minutes before serving. Shave a bit off the bottom of each egg white half so the filled eggs stay in place on the serving plate. 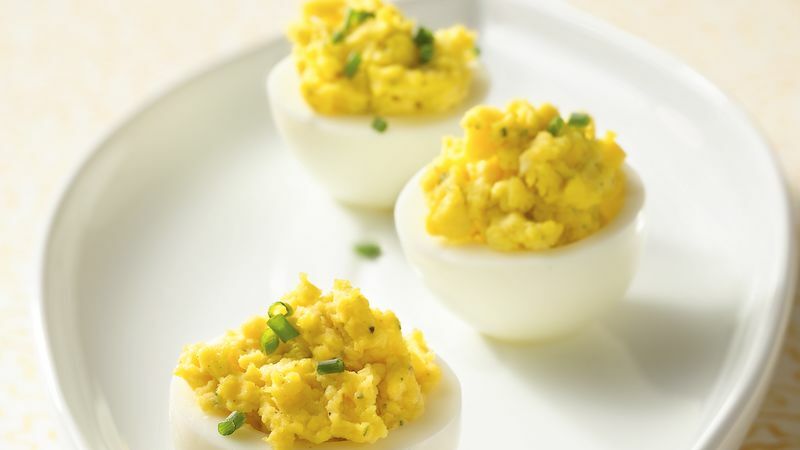 Make these eggs up to 24 hours in advance; cover and refrigerate until serving time.